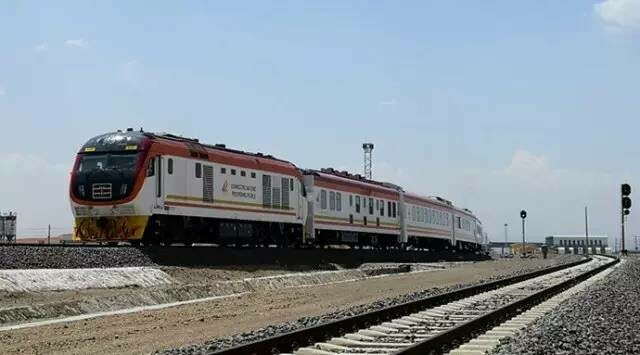 SGR Madaraka Express train is the direct train currently ferrying passengers between Nairobi and Mombasa which are the largest cities in Kenya. For tourists and travelers visiting Kenya, Mombasa and Nairobi are destinations one cannot afford to miss. Since its introduction in June 2017, SGR Madaraka Express train has been serving a large number of people daily. On average, 2000 SGR Train tickets get booked every single day for the journey between the two cities. The train has two classes: Economy class and First class. 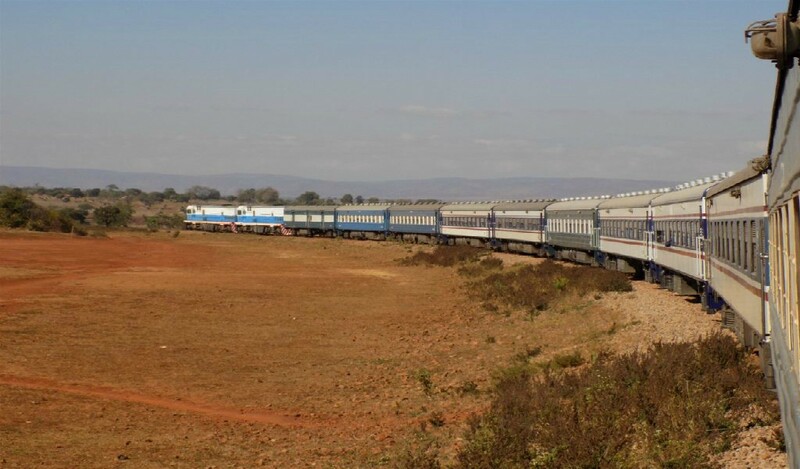 Being a four-hour train, the two classes do not have many differences compared to other long distance trains like Kilimanjaro ordinary train and Mukuba Express train from Tanzania and Zambia. Since I posted my first blog on Madaraka Express SGR trains between Nairobi and Mombasa, many travelers have been asking a lot of questions about the service. Here is a summary of answers to some of the questions I received. SGR Madaraka Express train arrives at Miritini, Mombasa station. 1. What are the schedules, fare, and stops for SGR Madaraka express trains? These are the SGR Madaraka Express train schedule, timings, ticket fares and destinations. Note that this is an express train and doesn’t stop at intermediate stations. According to Kenya railways, an inter-county train will be launched soon. Update: Ticket price for the economy class is Kshs 1000 while that of First Class is Kshs 3000. Check here. 2. How long does the Madaraka Express train take from Nairobi to Mombasa? The trains move at a maximum speed of 120 km/h. The journey from each city starts at 08:00 am and ends at 13:55 pm So the whole journey takes about 5 hours 55 Minutes for morning trains and about 5 hrs for the afternoon express train. 3. Where else can I get the SGR train tickets other than Syokimau and Miritini stations? Now you can get the train tickets at the respective stations, using Mpesa (See the answer below), or using the Kenya Railways Online Booking Platform. For international travelers without Mpesa which is Used to complete the payment online, See alternative method. 4. How can I book the train tickets via Mpesa? The picture below illustrates how to book SGR Madaraka Express Train tickets in Advance using Mpesa mobile app. You can also book the train tickets using USSD. This is currently the easiest way to book SGR tickets. All you need is a mobile phone with a Safaricom Sim Card. Follow these outlined steps and in just a few minutes you will have the tickets. 5. How can I book SGR Madaraka Express train tickets online? Currently, there is an online portal. Contact me or check Kenya railways corporation website for updates. 6. Can one book SGR Madaraka Express train tickets in advance? Booking SGR Madaraka express train tickets have been a challenge given the high number people traveling daily between these two destinations. It is advisable to purchase the tickets for about Three to Four days in advance. Go to the respective station (Miritini and Syokimau stations). Call Kenya railways to make a reservation and pay for the tickets using Mpesa or by visiting the station. Book online from the online portal (SGR Website online). 7. Where is the Nairobi SGR train station and Mombasa SGR train station located? Here are the google map locations for SGR Nairobi Syokimau station and SGR Mombasa Miritini station. 8. What are the luggage requirements for the Madaraka Express train? A maximum of 30 kg is allowed in the train. They have provisions to store your luggage. It should not measure more than 1.6 m in height, width, and breadth. Check the Kenya Railways Website for other conditions of permitted and non-permitted goods and items. 9. How do I get from Nairobi city to SGR train station? There is a commuter train from the city center at old Nairobi Railway station which transfers passengers to the main station every day at 06:00 am. 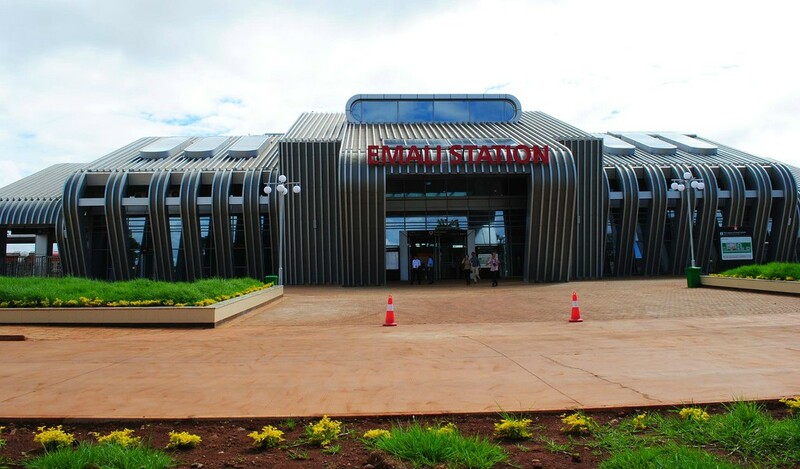 You can also board a bus at Railways bus station which will drop you at Old Mombasa Rd along Mombasa road. The Main station is at a walking distance from the main road. There are also boda-bodas (Motorcycle taxis) which will charge you Kshs 50 to the station. 10. When are the ticketing counters open? You can purchase the SGR train tickets From Monday to Sunday between 07:00 am and 16:00 pm East African Time. Booking is open 30 days before travel day. 11. Does Madaraka Express train have a restaurant? Yes. You can get water, tea, snack, and other refreshments on the train. 12. Can you buy the tickets for me/us in advance? I help travelers get the SGR Madaraka Express one way or return tickets in advance. You will pick them on arrival in Kenya or delivered to your preferred location within Nairobi. 13. Is there ticket refund policy in place if one misses the train? If you notify the SGR train attendants in advance before the train departs, you will get an 80% refund while the operators retain 20% as refund fee. You will not get a refund if the train has already departed from the main or intermediate stations. In any case, you will not get a refund if the train ticket is lost or damaged to a point where it cannot be recognized. Got more questions? Please feel free to ask them in the comment section below and share this post if it was helpful. 🙂 Happy travels on board Madaraka Express Train. Please note that the Train Schedule Has changed since November 01, 2017. The Express train now runs from 3:30 pm to 8:15 pm while the County train runs between 8:00 am to around 2:00 pm. Check the Schedule Here. The Schedule will change again effective December 01, 2017. Check out the 2019 SGR Train Schedule Here. N/B: There is no longer a 9:00 am train. Its so nice to SGR madaraka Express for easy transport. I hope to travel in it on Friday from Nairobi to Mombasa.kudos my government. I would like to travel to mombasa on the 27th of Dec, but in trying to book online, all the spaces are booked. what can i do ? I don’t think for 27th they are booked. Go there tomorrow morning (6:00 am) and you will get them! Hi, It is required that you have your original document to travel. But I guess if you have a good explanation and probably a police abstract you will be allowed to travel. I would advise that you check with Kenya Railways for that. Hello Roba. Well, First, kindly note that I am not affiliated with SGR. Kenyan Backpacker is an Informational website. To make the changes unfortunately you may need to go to the station. The other option you could try is message Kenya Railways on Facebook or comment in one of their posts. Hopefully, they will respond( Search for Kenya Railways on Facebook). All the best! I would like to cancel my ticket paid via mpesa for 22/4/2019 Nairobi to Mombasa at 14.35 and get a refund. Hello Oscar, In the Mpesa message, you have received there is an account number. Right? You will use this number to print the tickets on travel day or any day before then. Make sure you arrive early. From Mombasa, how does one access the public transport from town to miritini ? Thanks. How do I change my travel date after the booking? Just Use USSD by dialing *639# 7 days before 29th Dec.
What is the latest time one can arrive at the station in case of lateness is 30minutes before train depart possible and at what time does the commuter train leave town for Syokamau or is is it imara Daima to drop the 3:30pm travellers? Hi Irene. 30 minutes is possible. Just keep in mind that the train leaves at exactly 8:00 am (Inter-County train) and 3:30 pm (Express train). You might spend a few minutes through the checkpoints between the main entrance and your coach. The commuter train leaves the Old Nairobi train station at 1310 and arrives at Nairobi Terminus at 1400 Hrs. Keep checking the Kenya Railways website and facebook page for updates. The schedule may change anytime. Hello Winnie. Just Use USSD to get the tickets by dialing *639# about 9 days before your Travel day. Hi. at what time does the bus leave Mombasa town for miritini station to drop the 3:30pm travellers? Hope to travel on 5dec.God wish.will it be possible to get ticket on thesame day of my departure.a season like this. Is it in public that one should not carry along liquor on the train? Just a concern, why would they restrict and later sell it in the train? I am confused because mine was confiscated. Hi Ben, I wish someone else here would contribute to your question. I am not able to answer this! Try booking early enough. The ticket purchase window is open about 9 days before travel day. Just Use USSD by dialing *639# 9 days before 7th Dec.
We are travelling as group .can one person book for about 12 tickets and get seat in the same cabin? Yes. But if you use USSD, you can only buy 5 tickets at a time. (With this method it is hard to control seating arrangements unless you are among the first to book. The other alternative is the said person to go to the station and book the tickets on behalf of the rest. He/She has to go with Passport numbers and Names of other passengers. From *639#, th SGR train is indicated its full yet when I went in I was able to buy ticket. Its like there are tickets reserved for sale at the station to keep counter staff at least busy. But all said and done its good to plan in advance and pay if possible pay 14 days before travelling otherwise during the festive season its a challenge even to get ticket on 14days in advance. I had to wait till midnight ndio nilipe wakifungua. Dial *639#. You can check tickets availability as well as book if the tickets are available. hi how does one book for an adult and a child 9yrs? Sorry this is not what he means as I have encountered the same problem. for children write their two names and age like this. Martha kilonzi 16yrs. Please not insteant of ID since they are minor you write age (digits) and yrs (for years). Hope this has answered your question. This is the detail input format. Thanks Andrew for the Information. All useful comments are welcome. when is the best day to book l want to travel on 8 or 9 this month .is their night train . Try *639# again a couple of times. And if you have time, go and get the tickets at the station. Remember to carry the ID’s of the passengers! Excellent summary info. How are the sgr services for persons on wheelchair. Will i use my wheelchair on route or get an aisle seat? Hello Anthony. I can’t remember well, maybe someone here can help. But I am sure they have such services. For isle seat, it is absolutely possible. you can even swap with the next passenger! Hello. Well answered questions. Should I plan to travel to Mombasa soon, I will also ask one. You are supposed to get a message like the one below. The ****** is the Account number. You use that together with your mobile number(the one you used to book with) to print the tickets at the station on travel day (Arrive early). LK792YT4AP Confirmed. Ksh3,000.00 sent to MADARAKA EXPRESS Nairobi Terminus for account ******* on 7/11/17 at 1:01 PM New M-PESA balance is Ksh10.00. Transaction cost, Ksh10.00. hey I am trying to request your assistance to book a ticket to mombasa using the madaraka express train, however i have entered all the required details but it keeps telling me my date format is wrong. Exactly what date format do you require so that I can proceed? Hey am trying to call the number but nobody is picking.I want to book tickets for more than 10 people including kids from 23rd and return on 28th.Kindly assist. You can Dial *639# using your Safaricom line. This way you can check tickets availability and be able to book if they are available. Booking is open 14 days before travel so make sure you book from around 9th or so. With this method, you can only book 5 tickets at a time. The easier option would be to go to the station with the travel documents of the passengers and make the booking. I booked tickets to travel to Mombasa on 19th Dec and successfully got coaches and seat numbers. but I need to make change on two tickets for two kids who are 12 years and 14 years to kes 700 from 350 . How do I revise the fare to kes700 on existing ticket? Can I print the tickets before the travel date e.g on 12th Dec by going to Syokimau ? The best way to do this is going to the station and make your request as you print the tickets. (yes you can print them before travel day). To print the tickets you only need to send them with the Account number and the phone number you booked with. About changing the tickets i think they will probably listen to you better. Can i book 24th dec tickets tomorrow 8th? I need to book for 23rd Dec 2017….4adults and 1 child of 7years……can I book it by dialing the #639# and follow instructions or which is the safest so as not to miss the vacancy……from NAirobi to Mombasa? Hi Liz, If I was to book in advance I would use the same process (*639#) But clearly it is not working. Seems like there are some people doing it in advance! maybe go to the station and see if you can buy there. hi,i booked a ticket for 2 adults today (11th dec ) to travel on 24th dec. I only received mpesa confirmation with account no.656391 but there was no sgr confirmation with seat numbers. Is this ok?are my seats reserved? Hi,i book 2 tickets early this morning but i only received mpesa confirmation code 656391. i didnt receive sgr confirmation with seat numbers.is this reservation? You will use the account number together with the phone number you have used to book with to print tickets at the station. You cn do this on the day of travel or any other day prior. I booked via *639# a week ago for 13th Dec.
Can i send someone to get the tickets from the station on my behalf. Yes. With the account number together with the phone number, you used to book with. They are not yet open and I am not sure when they will open. I would advise you either go to the station yourself and try booking the tickets from Thursday or call the Kenya Railways SGR number 0709 388 888. Hi, can you book tickets in Nairobi for the journey the opposite way. Mombasa – Nairobi? Our Safari will drop us off in Mombasa but we need to get the train back. We will only have time to purchase tickets when we are in Nairobi. At the moment am not able to. Sorry. hi.. i need to cancel a ticket booked and paid for, 24 hours in advance, will i be paid back full refund, and what is the procedure? Hi Dan, On why they are rejecting calls I honestly don’t know. On what you can do, if you are trying to book a ticket, you can dial *639# or visit the station personally. The stations are open between 7:00 am and 4:00 pm daily. Thanks. happy new year,Id like to book to mombasa from 10th.Are the tickets available n what time?thanks in advance. how do I postponed my ticket to another day? You can not do it directly. The only way is to visit the station. I paid for a ticket and 4hrs later i am yet to receive confirmation text. How are may going to print My ticket without the confirmation text? HI, i have booked a train to Nairobi to Mombasa via mpesa and when i try to print it in the railway station it fails. After asking from the attendants am being told either to pay for another ticket or to use the mpesa message as a ticket on the travel date but the mpesa message only has an account number and nothing else. What do i do? Hey, if that is what the SGR told you, then I cannot be of more help. Sorry! The only way is by visiting the station. Can one change the date of travelling after one has booked? Visit the station with your ID. They can help you if the tickets for the new dates are available. i want to travel on 21 April, Nairobi to Mombasa, can I get a space to book? I want to book a ticket for someone to travel from Kibwezi to NAIROBI. How will she print the ticket? Once you book, give them your mobile number and the Account Number you get via Mpesa. That is all they need to print the ticket. I need to book for 6adults and 4kids. On the website, I can only do 5 adults. I would like for everyone to sit o=together or at least in the same couch. Please help. If you want everyone to sit together or close by, you might want to visit the station. On the website, you can only book 5 tickets at a time and you are not guaranteed to get seats close together. Is it possible to catch a commuter train from Nairobi to Syokimau for the madaraka express in the morning? What are the timings? Can one change the time that is on the ticket in a Case of an inconvenience? I’d also like to know this… ama when you’ve booked you can’t make changes? 30 days is the booking window. You can book/get the tickets any date within the 30 days. Hi, so can they allow a 17 yr old teenager to travel alone using the SGR?! This depends on the availability of seats, and you have to go to the terminal to do the booking (this can be frustrating if there if you find the train fully booked. The best alternative is to check availability of seats on your travel date and then ensure that you do the booking early to avoid inconviniencies. Dial *639# to check at no cost.